WWA Info Exchange • View topic - Hello Guys, How you all doing? Hello Guys, How you all doing? Post subject: Re: Hello Guys, How you all doing? Sixteen years ago when I first found the WWA the internet was a new thing for me. Although it had been around for a few years it was all but unusable for us here in London with only dial-up available. Of course, we knew no different in those days but I spent a long time looking at that blue line just to be able to read a post. Today everything is so different with speeds and memory far in excess of anything I had thought possible. YouTube is now the new forum and fantastic places like this struggle to survive. I must now be one of the most infrequent of posters having last popped my head above the parapet in January '17. Then I was talking about moving and our other interests. Well, much the amusement (bemusement?) of our friends we are still here - don't ask - It will happen one day soon, honest! In the meantime, while collecting together a lifetime of possessions, we realised just how much stuff we had collected over the best part of 40 years. We live in a large Victorian house that was two flats (apartments) when we bought it. We converted it back to a house and proceeded to fill it with stuff. Sue and I were not lucky enough to have any children so we had no reason to curtail our hobbies. It became apparent that there was one thing that had taken over our lives. The Meccano had become all consuming and we found that we were not only building with it we were getting sucked right in. We spent a couple of years working with the new Canadian owners and even got to design a few sets, working closely with the design department in L.A. The clear out had opened up a Pandora's box. we suddenly realised that it was going to only get worse. The direction the new company was going in was not to our liking and we decided to jump ship and sell the entire collection. This is something we have never done before. we have a handful of hobbies that we enjoy and we can be more involved in one than another from time to time. Never have we decided to get out completely. All this upheaval has focused back in the workshop where we are getting back into a spot of woodworking. I am not going to say too much right now, but we have just bought a cheap scroll saw and are finding out how to get the best out of it. Sue seems to be better at it than me. We have also acquired a pyrogravure pen and I am busy building a couple of sleds to cut small pieces of wood. 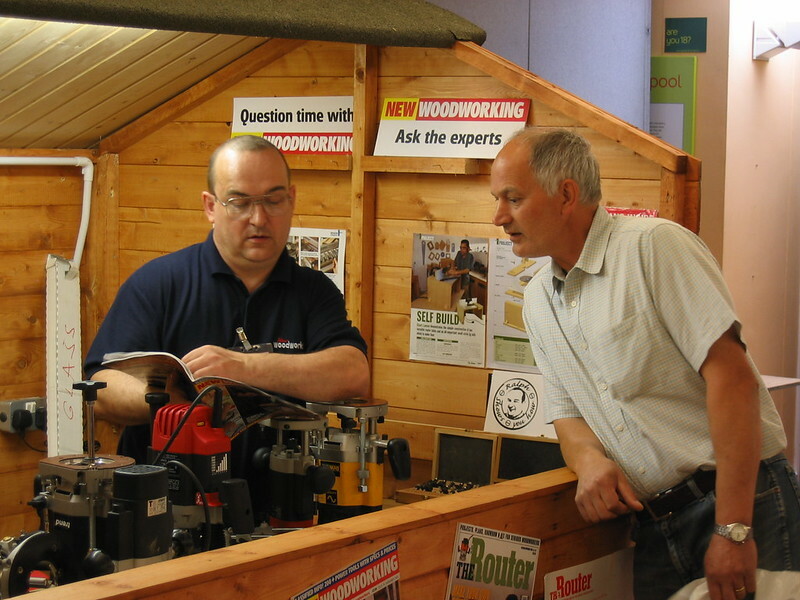 The turning tools are getting sharpened and we are keen to get going making sawdust again. Needless to say, all this is going on while trying to get moved, but this is business and we have to earn a living somehow. The heyday of forums may be over and the amount of traffic is reducing but I must say that my life would be very different today without my involvement in this and several other forums over the years. So come on, don't just read - Post! ...and, I know you all like pictures so here is one to keep this post vaguely woodwork related. Here is the younger me on-the-road with my shed! Ah Woody glad to see you post again. I envy you in that you and your wife share so many common hobbies. sharp things scare the Mrs.
Good to see your name here again. I enjoy seeing the projects some of the members here post. We have some very talented woodworkers here that do some very nice work and freely share their advice and experience. This is one of the few sites (2-3) that I post photos of my work. Some sites people just pick others projects apart here we all enjoy each others work and contributions here. Which is nice. He needed something for his sons to do their homework on. Nothing special but I like how nice it looks in its simplicity. Even the plywood was cheap, bought it at a recycle yard near Wisbech Norfolk. I made 2 as he had 2 sons. One just graduated High school at a DoDDs hs the other is going to a Uni in Cambridge (not Cambridge Uni another one). Im going to build one for my daughter when I finish her bed which is in work. I agree with you about this site. I have met a lot of good people on here, both in person and via the internet. Good practical looking desks you have made there. I too enjoy making stuff from reclaimed timber of all sorts. Time goes on and I have not been able to go fishing for a while due to several things. Mainly I have not been feeling well for a while and I eventually wandered around the corner to the Doc. The were surprised to see me as the last time I had attended (it turned out) was back in 1996! Anyway, after a lot of tests I was informed this week that I have type 2 diabetes. I am still trying to get my head around that one. At the moment it seems that lots of the things I like to eat are off the menu. I have some tablets to take and we will see how it goes. Now I know what it is, I can get on with some other things and get back into the workshop as well as find some time to go fishing. Just gotta watch what ya eat. Lots of info out there on it. Not eating the bread sodas, beer etc is not to bad once ya get used to it. Sure I snake a little ice cream every now and then but nothing like I used to. After I cut those things out my energy level started picking back up again. Yeah, Ron, I have to cut back on ice cream. Although it's not too bad. It actually takes me 2 nights to eat a half gallon!